Visual translation is only available online. Open the app. Tap . Take a photo of the text you wish to translate, or choose an image from your Gallery or Camera Roll. Take a photo of the text you wish to translate. 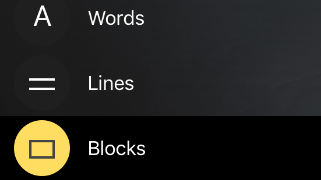 In the lower left corner of the app, tap and select Blocks. The button will not appear if you typed text into the translation field. 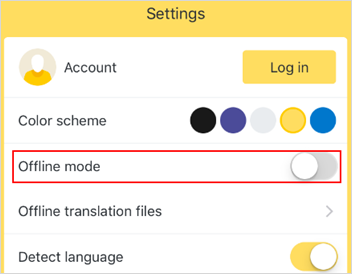 Check whether offline mode is disabled in the app settings. If offline mode is on, turn it off. Check your input language. Text recognition from images is possible if the text language is: Azerbaijani, Bashkir, Bosnian, Chinese, Czech, Dutch, English, French, German, Greek, Italian, Kazakh, Kyrgyz, Polish, Portuguese, Russian, Spanish, Tatar, Tajik, Turkish, Uzbek, Ukrainian, Japanese. The app can't decipher blurry text or cursive writing. Try to take a clear photo. Please contact the developers using the feedback form below. Describe your problem in as much detail as possible and attach a screenshot before you submit your message.